and beset by an international censure of the continued wave of executions in Iran, and the torture and inhuman treatment of political prisoners, especially women, as cited in the report by the UN Special Rapporteur on human rights in Iran, and the annual reports of the UK and U.S. among others, Iran’s clerical regime tried to break out of this impasse by organizing a guided tour of Evin Prison for over 50 foreign ambassadors on July 5, 2017. Evin Prison symbolizes all the atrocities of the clerical regime both in the past and present. The PR show was preceded by an absurd claim made the day before, by Javad Larijani, an Iranian regime’s human rights official, indicating that there were no political prisoners in Iran. After the foreign diplomats’ visit to Evin, the Iranian state media outlets followed suit, pumping reports claiming that Iran’s biggest jail had been upgraded to state-of-the-art conditions. Then came the alarming reports of 57 executions in the beginning of July and the pending executions of another 120 inmates to be carried out soon. The sequel of events makes complete sense. The orchestrated tour of Evin by foreign diplomats, without any human rights organization or expert accompanying them, was an attempt on the part of the regime to debunk growing international criticism of Iran’s human rights violations, especially in its prisons. The question is, if the Iranian regime truly intends to be transparent, why not permit the UN Special Rapporteur on human rights, Mrs. Asma Jahangir, visit Iranian prisons and have unlimited access to any and all areas of each and every single prison across the country? What needs clarification to the outside world is the fact that Evin, along with many other prisons, has a dark history of widespread executions, tortures, and inhumane and unbearable conditions, to say the least. The regime in Iran, with a track record of 63 UN condemnations of human rights violations, is hardly in any position to claim of providing inmates with adequate conditions. 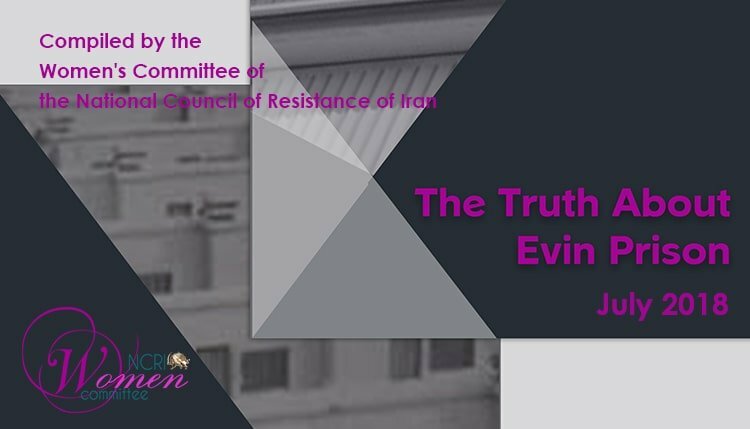 This booklet, compiling a few letters and articles, attempts to shed light on the truth in Evin Prison in the words of the victims and experts. The following article by Raha Bahraini, Amnesty International’s Iran researcher, appeared on the website of the British daily INDEPENDENT on July 13, 2017. Last week the Iranian authorities arranged a rare international visit to one of the country’s most infamous places of detention – Evin Prison in Tehran. This visit wasn’t arranged for an international prison expert or a human rights body. It was for representatives of over forty foreign diplomatic missions from Europe, Asia, Africa and South America. The UK had a representative there. The foreign delegates were shown around some limited areas of the prison, and there was a roundtable discussion, held outdoors in a lush garden. There are photos in circulation and you can see various countries’ flags perched on al fresco tables, the Union Jack amongst them. By the standards of diplomatic meetings, it all looks rather idyllic. But what was it all for? For the Iranian authorities it was very clearly a PR exercise. In the days after the visit, Iranian state media outlets were flooded with gushing stories about Evin’s supposedly state-of-the-art conditions. The “excellent facilities” were showcased, including an in-house beauty salon, a gym, a library and even a restaurant. And articles featured congratulatory comments from the Indian, Indonesian, Portuguese and South Korean delegates. What these stories left out was the fact that Evin is a vast prison complex made up of multiple buildings where conditions vary enormously. The visitors saw only a handful of sections in buildings 4 and 7, mostly housing wealthier prisoners convicted of financial crimes. In these areas prisoners have used their own money to improve conditions, buying carpets, curtains, televisions, air-conditioning units and kitchenware. The beauty salon, gym, library and restaurant are only accessible to prisoners held in building 7. Away from these select parts of Evin, things are much bleaker. Research reveals widespread inhumane and unsanitary conditions. There’s chronic overcrowding, severely limited hot water, poor ventilation, and infestations of cockroaches and mice. Prisoners have described being forced to sleep on the floor because of a shortage of beds and being fed “barely edible” meals. Unsurprisingly the visitors didn’t see any of this. Ahead of the visit, some prisoners in building 4 were also transferred to create an illusion of humane living conditions. Walls were freshly repainted and the remaining prisoners warned against approaching the diplomats to voice any concerns they might have. Meanwhile, the delegation was entirely barred from accessing areas of Evin controlled by the Ministry of Intelligence and Revolutionary Guards, where detainees are routinely held in prolonged solitary confinement and tortured. Similarly, they weren’t allowed to see where the dozens of prisoners of conscience are held. This includes building 350, where the prominent human rights lawyer Abdolfattah Soltani and severely-ill human rights activist Arash Sadeghi languish; building 8, which holds human rights activist Omid Alishenas; and the women prisoners’ wing where human rights activists Narges Mohammadi, Golrokh Ebrahimi Iraee and Atena Daemi are serving their sentences. And neither were they able to meet several dual-nationals jailed on spurious charges, including the British-Iranian charity worker Nazanin Zaghari-Ratcliffe or the British-Iranian businessman Kamal Foroughi. Meanwhile, the Iranian-born Swedish resident Dr Ahmadreza Djalali was transferred to solitary confinement for the entire duration of the visit. After the delegation had made their Potemkin village-like tour of Evin, Kazem Gharibabadi from Iran’s High Council of Human Rights said that Evin’s supposedly comfortable conditions are typical of the country’s high prison standards. With one ludicrous claim after another, he insisted that prisoners in Iran enjoy “perfect access to medical care” – notwithstanding a report from last year showing how Iran’s political prisoners are denied access to adequate medical care as a particularly cruel form of punishment. Back in the real world, Gharibabadi’s remarks are an affront to the hundreds of prisoners – peaceful activists, journalists, intellectuals and human rights lawyers – who’ve suffered miserably at Evin throughout its disgraceful history. Every year, scores of prisoners in Evin and other prisons go on hunger strikes in protest at appalling conditions. The unvarnished, un-PR-able truth about Evin Prison is that it’s a place of suffering and torment as well as a wider symbol of rampant political repression in Iran. The foreign delegates may not have known the details of their highly-controlled visit in advance, but it should be clear to them now they’ve been used by the Iranian authorities in a piece of propaganda. They ought to speak out against torture and other ill-treatment of prisoners in Iran, as well as the arbitrary detention of human rights activists and other peaceful critics. And they ought to demand that the Iranian authorities open Evin and other Iranian prisons to independent international monitors. This wasn’t a genuine prison visit; it was crude political theatre. Political prisoners Atena Daemi and Golrokh Iraee wrote an open letter to the ambassadors of 45 foreign countries who went on a guided tour to Evin Prison on July 5, 2014. Atena Daemi is serving a seven-year prison sentence solely for her peaceful human rights activities opposing the death penalty, participating in protests against executions, and sending information about abuses of political prisoners to human rights groups based outside Iran. Golrokh Ebrahimi Iraee is sentenced to six years in prison for writing a fictional story about the cruel practice of stoning which has not been published, yet. We were informed that on July 5, 2017, a delegation of some 45 ambassadors residing in Tehran were invited to pay a visit to Evin Prison. Ironically, this invitation was on behalf of the Iranian Prisons and the Islamic Human Rights organizations. It is part of the Iranian tradition to ensure that your house is clean and presentable when you invite guests. Hence, it was inevitable that the area across from the present office of Implementation of the Verdicts in Evin which used to be the place of the firing squads and executions of political prisoners in the 1980s would now be transformed into a reception area for 45 ambassadors. We are addressing you, the honorable ambassadors who were invited to tour some selected parts of Evin Prison as the gentlemen wished. All of us – you and us – know that it has been a long time that the Iranian regime and particularly the Prisons Organization have been sanctioned for flagrant violations of human rights. For many years, the Iranian regime has refused to let in the United Nations’ Special Rapporteurs (Mr. Ahmad Shaheed and Ms. Asma Jahangir) to visit the prisons. But now, you, the ambassadors residing in Tehran, want it or not, have become mouth pieces for the Iranian regime, helping them to invert the truth about the situation of human rights in Iran. Do you know how many wards and detention centers are there in Evin Prison? Did you manage to visit the Ministry of Intelligence Ward 209, the IRGC’s Intelligence Ward 2A and the Judiciary’s Intelligence Ward 241? Did you see the windowless cells which lack any ventilation and lavatory, and are used for solitary confinement? Did you see the small rooms and dingy dungeons used for interrogation? Did they show you the notorious cells known as “the grave”? What about the covered “fresh-air” yards and the blindfolds and handcuffs? According to the Iranian newspapers, you were stunned by the great conditions of both the prisoners and the whole prison atmosphere. How many prisoners did you talk to? Were you informed of the number of detainees, the length of solitary confinement, the methods of interrogation, or the various physical and psychological tortures? Indeed, why weren’t you brought to the only political women’s ward of Evin, where we are currently imprisoned. Probably, you were told that Evin has no women’s ward. A lie as big as the other one when they said there were no political prisoners in Iran. We know that you could not and will not be able to do so because they did not and do not want you to find access to the files of even a few of the prisoners and find out about the depth of the tragedy. So, we are going to write about the same area that stunned you so much. Did they tell you how and who renovated Ward 4 where you visited? You need to know that the same prisoners who paid millions for the renovation expenses of that ward were taken away on the day of your visit. Pretending to take the prisoners for trial or hospital visits, they took them to Ward 2A and kept them there until you left the prison’s premises, so neither of you could see one another. Did they mention that prisoners held on financial charges and political prisoners are held in Ward 4 along with all kinds of ordinary criminals? The day before your visit to Evin, they stopped allowing newspapers into the prison because they did not want us to learn of the visit, fearing that somehow the truth would come to light. You made comments about the prison’s hygiene, so let us tell you about the hygiene in the Women’s Ward of Evin, about the clinic’s conditions and wrong prescriptions, about the lack of detergents and disinfectants justified by sanctions and budget deficits. Did you hear about the number of prisoners with HIV or hepatitis who are detained in the same place with other inmates? Did they tell you that due to religious restrictions on female prisoners being seen by male doctors, the women imprisoned in Evin do not receive injections or ECGs? Did they mention that there is not even a single female nurse who could carry out these tasks for us? Were you informed of the thousands of prisoners who suffer from kidney problems due to the prison’s unclean drinking water? Did they introduce you to a doctor known by the name of Shahriari? A physician who makes his diagnoses without examining the patient and only by looking at her; the one whose prescriptions do not bear his stamp fearing the consequences of his wrong or bad diagnoses. We wish you could have ridden the ambulances and seen first-hand the absence of the necessary equipment. We wish you had asked your hosts to show the footages recorded by the prison’s cameras two days before your visit so you could see the unsanitary conditions of the prison, and the prisoners’ uniforms which are yellow for inside the prison and striped blue for outside. We wish you could see the series of doors which are locked and sealed on prisoners one after the other – and even on prison guards in every shift– to find out how long one has to wait for the doors to be unlocked during an emergency exit for the transfer of a sick prisoner in emergency conditions to a hospital. Let us give you an example from the Women’s Ward of Evin Prison, where the emergency exit passes through three locked doors. You can calculate the amount of time needed to open each door after calling and coordinating for the soldiers to come and unlock the doors. Only if you could see the number of women who must squeeze to sleep on the floor of the hall since there are no beds. Only if you could taste the food that’s distributed to prisoners. Did you know that prisoners have to buy at their own expense their needed dairy products, vegetables, fruits, and protein at rocket high prices from the prison’s store? Because the small amount of the food distributed in prison on a monthly basis, is rotten and expired. We wish they had explained to you about the millions (of toumans) of monthly profit they make through this business. Nevertheless, they should have informed you that just one day prior to your visit to Iran’s largest prison, there were no vehicles there because the drivers of the taxis designated for the transfer of prisoners to medical centers and courts were on strike and did not come to work to protest having not received their salaries for several months. Were you advised of the existence of deserted wards such as Ward 350 (men’s political unit) or the clergy’s ward? Have you ever been told of the number of people who spend their entire detention in solitary confinement? People like Muhammad Ali Taheri who has been in IRGC’s Ward 2A solitary confinement for more than 5 years. We find it critical that you know that contrary to the claims of the director of the Prisons Organization (Mustafa Mohebbi), we can be visited by our families only once a month and not every week. You could have easily learned of Evin’s geography through satellite images. You could have read various reports by reliable sources about the wards in Evin and other Iranian prisons. You could have even named some political prisoners and asked to meet them. You could have entered and inspected this prison with prior knowledge. Although none of these steps were taken, we would like to urge the honorable ambassadors to at least refrain from taking part in false reporting on conditions of Evin and its prisoners. Instead, you can pay unexpected visits to Evin, Qarchak, Fashafooyeh, Rajai Shahr and other prisons in Tehran and other cities to get a more realistic picture. Countless political prisoners have been incarcerated because we wanted to provide a real picture of the human rights situation in the Islamic Republic of Iran. We have paid high prices for this cause, our families have been continuously harassed, and yet we are concealed from you. We, who hoped to bring about small improvement in prison conditions and conditions of the prisoners, are now in jail. You, honorable ambassadors, have delayed the realization of our demands because your presence in Iran’s biggest prison was used to print big headlines: “Some countries and their media show a false and inaccurate image of Iranian prisons.” They invited you to take advantage of you and through stage-managing and deceit, refute the reports of international human rights organizations as baseless and unfounded. While you could and you can help improve the conditions by presenting a real image, not a theatrical and symbolic one, of the Iranian prisons. We, the signatories of this letter, urge you to demand that the Iranian Prisons Organization and the Islamic Human Rights Institute allow the UN Special Rapporteur, Ms. Asma Jahangir, to come to Iran, inspect the prisons and visit political prisoners and social activists. Maryam Akbari Monfared, a political prisoner detained in the Women’s Ward of Evin Prison, addressed a letter to the ambassadors who recently visited Evin prison. She wrote about issues that had been concealed by the Iranian regime’s authorities during their visit. For all those whose hearts are beating for human beings and humanity, for values that go beyond geographical boundaries. I am writing as a witness to the endless and dreadful days of Shahr-e Ray, Gohardasht and Evin (prisons)… Dark silos with high ceilings, no windows or any opening for natural sunlight, each filled with the smoke of cigarettes and the hubbub of 200 detainees which drive everyone insane. I saw with my own eyes the regression of human beings and humanity. I have witnessed stormy moments. I saw the eyes of prisoners filled with rage as Special Guards struck their batons on the frail and feeble bodies of women and girls. I have witnessed fights over bread and food in the dining hall, which prisoners have renamed the “beating hall.” The ration of food given to prisoners was so small that hungry inmates collected residues in dishes and crumbs fallen on the ground. A few moments later, you could hear the trays and chairs being thrown around in a fight over the crumbs left on the dirty and contaminated floor of the dining hall where several people fainted every day. I have seen beautiful girls who became victims of the trumped-up charge of having illicit relationships. I personally saw an 11-year-old girl who had been sent to exile to Gohardasht Prison from the Juveniles’ Correction and Rehabilitation Center. The 11-year-old girl had been charged with using drugs. Can you imagine what this little girl will learn in Gohardasht Prison while held together with a large number of dangerous convicts? I have seen how women and girls were mired in miseries they could do nothing about, willing to do anything the prison guards wanted them to, just to get 15 minutes of telephone time or a few days of furlough. I have seen the oppression women and girls went through, in their beautiful faces. Those who had repeatedly felt the weight of a hanging noose around their necks. Women and girls who have been waiting long years on the death row. Can you imagine what it feels like to anticipate your imminent death every day? I am writing as a witness. I have witnessed extensive efforts made to invert the truth and refute the news and reports published on the internet about the gross violations of human rights in Iranian prisons. A large number of prisoners were transferred to the security wards of Evin Prison and other locations while the honorable ambassadors came to Evin Prison on July 5, 2017. This is itself a strong proof of the deplorable conditions in Iranian prisons. Honorable ambassadors, you were surprised by what you saw, but what you saw was a Potemkin Village set up by the clerical regime. The moment I saw the picture of your meeting in the newspapers, I wished the tall, lush trees that had spread their shade to protect you for the hours you held talks, could speak out. I wished those trees would tell you of the scenes they have witnessed since they were just saplings. As someone who is serving the eighth year of her sentence, I have seen my fellow inmates every day and every moment, as their health deteriorated. I’d like to make special reference to Mrs. Mahvash Shahriari, who is serving her tenth year. There were others who are presently out of prison, including Mrs. Kobra Banazadeh, Nahid Malek Mohammadi, Motahareh Bahrami, etc. I have been held behind bars under inhuman conditions. Mr. Mohebbi, Director General of Iran’s Prisons Organization, said that they had undertaken numerous measures in prisons to teach skills, educate and train inmates, fill their free time and make use of their term in prison to teach them skills such as making mosaic, hairstyling, etc. The question is, while the most basic human rights of inmates are not respected, what’s the use of learning hairstyling and mosaic art? Mr. Mohebbi said that inmates are busy working in sewing and carpentry workshops, with 50 percent of their income given to their families, 25 percent given to them during their prison term, and the remaining 25 percent paid upon their release from prison. Did Mr. Mohebbi say anything about how much the inmates earn? He said that prisoners were learning to translate English, while no foreign language books are allowed into Evin because there are no foreign language interpreters! Are all these things happening under the sky of prisons across the country? The paradise of Evin and other prisons. . . It is truly amazing. Then, where on earth are the prisons that I have seen? You mentioned the teachings of the Quran. For your information, the prisoners are forced to memorize the verses of the Quran. They perform religious rituals to gain better prison conditions or to earn a few days of leave or to be spared the hanging noose. They do not care for the spiritual meaning. Mr. Gharibabadi, the deputy for international affairs at the Human Rights Staff, said that some countries and media show a false and inaccurate image of Iranian prisons! If this is the case and if there are such excellent conditions in your prisons, why is it that Mr. Ahmad Shahid, the (former) Special Rapporteur on Human Rights in Iran, and Ms. Asma Jahangir, the current one, have never been allowed to visit Iran, let alone visiting the prisons? Mr. Gharibabadi has also spoken of the “valuable” health services offered in prisons. Was it not in these very prisons that Mr. Mohsen Dokmechi became ill in the absence of medical treatment and subsequently lost his life due to illness? Was it not Mr. Hoda Saber in this very Evin Prison who lost his life because of delay in his transfer to a medical center? At this moment as I am writing this letter, my fellow ward mate, Azita Rafizadeh, is suffering from a broken finger. She has a 6-year-old son, Bashir, and her husband, Peyman Kooshak-Baghi, is also imprisoned in Gohardasht Prison. Her finger got fractured at two points on July 6, 2017. However, up to this date, which is the third day following the accident, no authorization has been issued for sending her to a hospital to receive medical treatment. Yes, I’ve been witnessing moments and conditions that my pen is incapable of describing. I decided to step in freedom path and while passing this route, I’ve become injured with harassments. Exile, transfers, and prohibitions have become part of my life. I’ve witnessed the deserts of Gohardasht and Evin prisons, where even plants fail to grow; gradual-death camps, not places to serve your prison term. I can still hear the sound of human dignity being crushed. Iran has opened the door – just a crack – to provide a glimpse of life in Tehran’s notorious Evin prison, home to many of the country’s highest-profile political prisoners. Foreign ambassadors for 45 countries visited Evin last week, an attempt, “to rebut the false human rights claims made by some western governments and media, including on our prison conditions,” according to Kazem Gharib Abadi, deputy of foreign affairs for the High Council for Human Rights which arranged the visit. Following the visit, Tasnim News Agency, which is close to hardliners in Iran, claimed several ambassadors were “astonished” by the quality of this prison. Less astonishing is the fact that none of the political prisoners serving sentences there after seriously flawed trials participated in meetings with any of the foreign diplomats. Nor was the topic of due process rights even reported to have been discussed in the visit. Iranian rights defenders and former political prisoners have expressed skepticism the visit was nothing more than a cynical public relations effort. “These are usually engineered meetings where they prepare room and couple of prisoners before for them,” Taghi Rahmani, a political activist who spent 13 years in prison, told Radio Farda. Authorities have closed Evin prison to independent international and national human rights investigators for more than a decade. The UN Working Group on Arbitrary Detention and the Special Rapporteur on the promotion and protection of the right to freedom of opinion and expression were the last international experts to visit the prison in 2003, including ward 209, where political prisoners are kept under Ministry of Intelligence supervision. No UN rapporteur – including the special rapporteur on Iran – has been granted access to the country in more than a decade. There are at least ten standing requests by different UN human rights experts to visit Iran, in addition to regular requests from human rights groups, including Human Rights Watch, to meet with officials in Iran and discuss rights concerns with them. In this restrictive context, the judiciary’s apparent attempt to offer even limited access to Iran’s prison system to outside observers is a positive one. But if they want to signal something more than a public relations ploy, Iran should grant unrestricted access not just to foreign diplomats but also UN rights bodies and independent local and international human rights experts to these prisons, in which case due process violations, lack of fair trials and prison conditions will undoubtedly be topics of discussion.